Indium Corporation will feature precision gold-tin (AuSn) solder preforms for die-attach at AeroDef 2016, Feb. 8-10, in Long Beach, Calif.
AuSn preforms are designed for high-reliability applications, such as aerospace, defense, and medical. 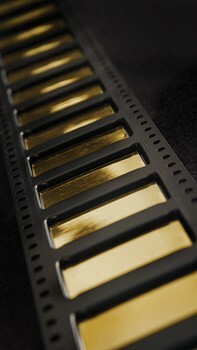 Gold-based solder has a high melting point, ranging from 280°C to 1064°C (depending on the alloy), making it compatible with subsequent reflow processes. This alloy has the highest tensile strength of any solder, ensuring high-reliability for joining and sealing. In addition, gold-based solders are resistant to corrosion, provide superior thermal fatigue resistance, and exhibit excellent joint strength. Indium Corporation’s Pb-free and RoHS-compliant AuSn preforms are available in a variety of standard and custom-engineered designs. Indium Corporation’s precision manufacturing processes and technologies ensure repeatable success in a production process. In addition, Indium Corporation partners with die-bonding equipment manufacturers to ensure that its preforms are engineered to work with equipment from assembly through reflow. For more information about AuSn preforms, email askus@indium.com, visit www.indium.com/solders/preforms/gold, or stop by Indium Corporation’s booth #311.